Barry Eccles will be laid to rest on Friday, he passed away earlier this week, only in his early 40s after a brief illness. Barry was a son, brother, husband, father and uncle, to many though he was one of the most talented footballers of his generation. The young Barry honed his footballing skills as a child living in the Lammy area of Omagh on the old St Conor’s Primary school pitch before being coached by the likes of Eamon Mc Gale and Joe Mulryan at Omagh St Enda’s where he thrived as a talented forward. The young Barry, along with his team mates enjoyed wonderful underage success with Omagh and it wasn’t long before he was moving through the ranks progressing to the clubs senior ranks , he certainly impressed and on his debut for Tyrone in the national football league in 1997 against Wexford in Gorey he scored 2-4. His Tyrone career was perhaps not fully fulfilled but he was a committed club player. 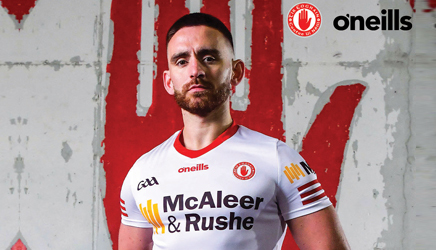 In the Summer of 1998, just twenty short years ago he was lining out for the St Enda’s through the Tyrone senior football championship, a journey that took the team all the way to the final. The O’Neill cup eluded Barry and Omagh but there was a league title and the continued enjoyment of playing alongside his friends. Work and life took him away from Omagh, he settled in Cookstown where he married Tracy but he always returned “home” and as always was the life and soul of any get togethers he attended with his lifelong team mates and friends. Barry was an exceptional player, leader and friend whose humour and outright decency will be sorely missed in Omagh, Tyrone and further afield by all who had the privilege of crossing his path. Our sympathy to Barry’s wife Tracy, children Ryan, Katie and Sophie, and his parents Sean and Sheena and sister Claire as well as to the wider Eccles and McGrail families. Funeral leaving his late residence at 10 Old Rectory Park, Cookstown, on Friday at 10.45am for 11.30am Requiem Mass in Holy Trinity Church. Interment afterwards in Forthill cemetery.